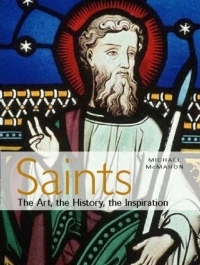 “Saints: The Art, the History, the Inspiration” is a modern classic – a warm, humane, and beautifully balanced insight into the lives of some of the most extraordinary people who have ever lived – the dazzling panoply of Christian saints. Author Michael McMahon brings an enlightened passion to his subject, and brilliantly illuminates the stories of these powerful, charismatic personalities. Here, an amazing array of individuals are linked over two thousand years in time by a common bond of sainthood.Throughout history, and across the globe, every one of them has been inspired, strengthened and guided by Christian belief. And these heroic characters have responded to the events in their lives in many different ways – as dissidents, teachers, mystics, martyrs, and miracle workers. Richly illustrated, this is a breathtaking visual feast, with images from illuminated manuscripts, mosaics, glorious paintings, sculptures, icons, and cinema clips that explore and reveal the amazing experiences of saints down the ages. and devotional... accessible and delightful"